While Asian restaurants used to feature a limited selection of hot rice and noodle dishes paired with meat and vegetables, the popularity of cold Asian dishes, such as sushi, is increasing rapidly throughout the world. Sushi is exotic and flavorful, and consumers love to try new sushi rolls and sashimi dishes at their favorite Asian restaurant. Here are five tips that can help you prepare the perfect sushi for your customers. First, make the white rice used in your sushi rolls ahead of time. Rice must be exceptionally sticky for it to work as a binding agent in a sushi roll. 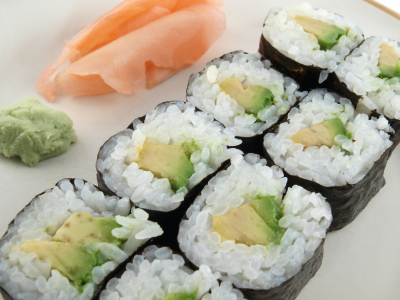 Freshly made rice has a moisture content that is too high, and warm rice will not stick very well in a sushi roll. Making large quantities of sushi rice in advance will ensure that you have the rice you need on hand to make high quality sushi rolls. It is imperative that you use high quality, fresh and cold fish when preparing sushi rolls. There is always a risk of food-borne illness when consuming raw meat products, but those risks are substantially diminished by using wild-caught, fresh fish that is kept at a low, refrigerated temperature. If your fish comes to room temperature, bacteria can begin to grow within the fish. Substandard food prep areas and low quality fish may make your customers ill and expose your business to legal ramifications. The quality of sushi is often determined by the quality of the vegetables you use in roll preparation. Unless your vegetables are fresh, crisp, and flavorful, the flavor of your entire roll may be in jeopardy. Use vegetables that are in season for the best flavor. To avoid serving customers bland sushi rolls, be sure to incorporate spices such as red or black pepper, chili powder, garlic and paprika when preparing sushi rolls. Using sauces such as salty soy sauce or sweet and tangy eel sauce can also add a greater depth of flavor to your sushi rolls. One great tip for taking your sushi menu to the next level is to incorporate a little of the exotic or the unexpected in your sushi rolls and sashimi dishes. For example, adding something unexpected such as octopus or fish roe can add delightful flavor, texture and cultural appeal to the sushi you offer customers. Customers often love to try new dishes, and including a fish or ingredient that is native to Asian cuisine, but not common elsewhere is a great way to lend authenticity to your sushi. Conversely, you might consider incorporating some ingredients common in other cultures into your sushi dishes. Sushi rolls that use barbecue sauce, crunchy potato chips, Mexican guacamole, or even Alfredo sauce are novelties that are quite popular with consumers. Think outside the box when you are preparing a sushi menu for your Asian restaurant. Using prepared white rice, high quality fish that is fresh and cold, crisp and clean vegetables, exotic and flavorful spices and sauces, and other unique ingredients will ensure that you have something on the menu that will delight your customers.